Chez Sophie is located on the island of Santorini. This complex of villas offers rooms with stunning views of the sea or the mountains. The beach of Kamari is only 100 meters from the Chez Sophie. This room has a view of the mountain or the pool. This room can not accommodate cots or extra beds. Room with views of the sea or the pool. The indicated rate is for adults 2. The room can accommodate up to 4 people. The third and fourth guest can be accommodated in an extra folding bed for an extra charge. Suites include a porch with a hot tub in the front and a balcony in the back. Guests of the suites have free pick-up service from the port or airport. This room can accommodate a maximum of 3 adults (in 1 double bed and 1 folding bed). Room with a patio, air conditioning, satellite TV and a fridge. It is located on the ground floor. 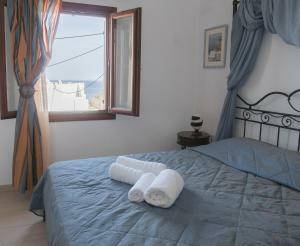 Double room with sea view and air conditioning.